The BCX1020RL features the Fujitsu F53 - Dual-Note Bill Dispenser and one Standard's Modular Series Steel coin hopper in a Rear Load cabinet style. The dispenser allows the owner to load the bills vertically, directly into the dispenser. The BCX1020RL is programmed to dispense the pay-out you specify using our Expanded Function (EF) Module. If you wish to have a more sophisticated pay-out, you can use the EF Module in the field to make best change for your business services. 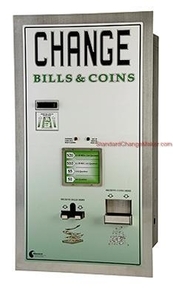 Contact your local Standard Change-Makers Distributor for more information on these machines.